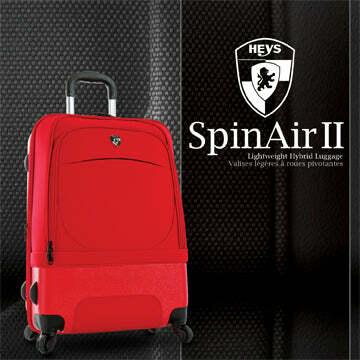 Home / ALL / hybrid-luggage / piggy-back-strap / carry-on / 100-150 / SpinAir II 21"
The Best of Both Worlds - The combination of materials used in the SpinAir II allows it to have the the strength and support of a hard-side luggage with the convenience and functionality of a soft-side luggage. Its structural design allows the luggage to be completely frameless, this allows the luggage to be extremely lightweight. The soft-side front panel is made from 1200D Polyester which allows for pockets along the front panel, a feature that is not possible on full hardside luggage. Its Spinner wheels provide easy maneuverability and they allow for effortless gliding in different terrains. Functionality can be found in its zippered expansion system which adds 25% more packing space. It features a Piggy-Back system, so that you can carry multiple pieces of luggage with just one hand. It also has a fully lined interior with a built-in divider with a mesh pocket, and an internal telescopic handle system with a push-button locking system.